Co-written by Oren Moverman and Alessandro Camon, THE MESSENGER is a powerful and tender story about a returned war hero making his first steps toward a normal life. In his first leading role, Foster stars as Will Montgomery, a U.S. Army officer who has just returned home from a tour in Iraq and is assigned to the Army's Casualty Notification service. Partnered with fellow officer Tony Stone (Harrelson) to bear the bad news to the loved ones of fallen soldiers, Will faces the challenge of completing his mission while seeking to find comfort and healing back on the home front. When he finds himself drawn to Olivia (Morton), to whom he has just delivered the news of her husband's death, Will's emotional detachment begins to dissolve and the film reveals itself as a surprising, humorous, moving and very human portrait of grief, friendship and survival. 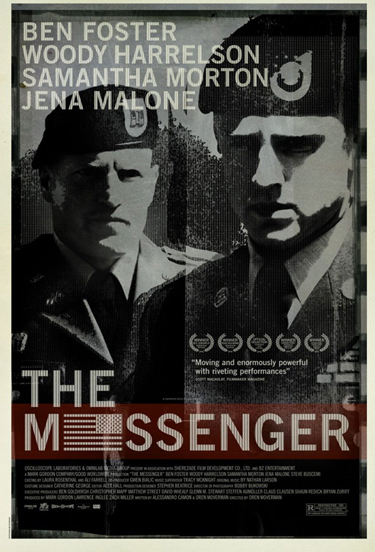 Featuring tour-de-force performances from Foster, Harrelson and Morton, and a brilliant directorial debut by Moverman, THE MESSENGER brings us into the inner lives of these outwardly steely heroes to reveal their fragility with compassion and dignity. Audio commentary with director Oren Moverman, producer Lawrence Inglee, Ben Foster, and Woody Harrelson. NOTIFICATION: A documentary about US Army Casualty Notification Officers and the families of falled soldiers by Joe Kelly and John Vernon. GOING HOME: Reflections from the set. Variety Screening Series Q&A with Oren Moverman, Woody Harrelson, Alessandro Camon, Lawrence Inglee, Ben Foster, and Bobby Bukowski. An exclusive essay by Anthony Swofford.